Are you planning a camping vacation soon, or probably just an outdoor party in your backyard? If, yes am pretty sure you will be grilling something. Grilling is one of the best alternatives to cooking with oil. It involves cooking foods such as beef, pork, fish, vegetables or bread on a grill using direct dry heat. Most grills use charcoal or gas as the source of heat though in recent advancements in technology we have seen electric grills in the market. Grilling is not just any other form of cooking; it’s a fun way of cooking. If you are a man who wishes to surprise your girlfriend, wife or the girls at the BBQ party, here the secret, wear something will crack their ribs. You are probably wondering what that would be,grilling aprons, let me show you. Here is a list of the funniest Grilling Aprons for Men. 5. BBQ Apron Funny Aprons For Men May I Suggest Barbecue Grill Kitchen Gift. 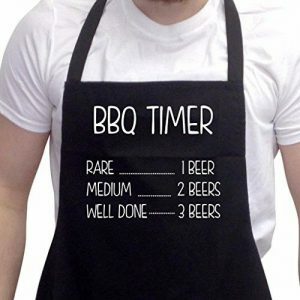 This is an excellent BBQ grilling apron for men. It is made of 80% polyester and 20% cotton twill. This apron has a funny sausage BBQ print message that will keep all your guests at the BBQ grill party smiling. It is an ideal gift for your dad or boyfriend on the next Father’s day or his birthday. This is perfect when you wanna show people that you are having fun. It doesn’t make some big nasty statement but it’s more of a feel good apron. Yes to beers. Because you can never have enough. Another funny one. I haven’t used it but the reviews for this one are great. The size and material used are of a good quality too. We love bacon and this apron brings that point home. But the reason I consider it to be one of the best funny aprons is because of it’s quality. You can use this for years to come hence it makes for a very practical gag gift. Both useful and funny!